Kalm Cosmetics, authorized retailer of Real Techniques Brushes and Mehron Makeup in the Philippines, is sponsoring this Real Techniques Brush Giveaway. 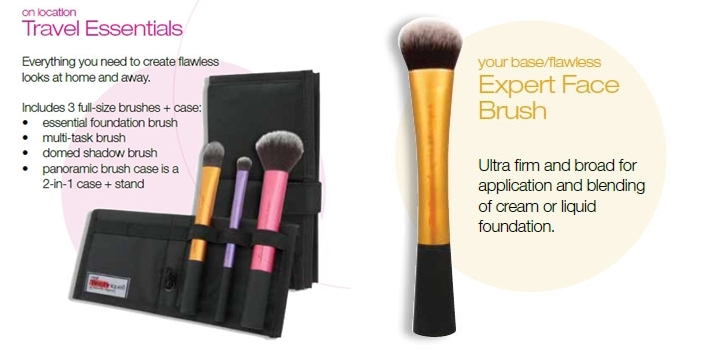 There will be 2 winners of Real Techniques Travel Set which includes: 3 full-size brushes (essential foundation brush, multi-task brush and domed shadow brush) and a panoramic brush case which is a 2in1 case + stand and 3 winners of Expert Face Brush. Joining is easy! The giveaway will start from 12am of May 11, 2013 until May 24, 2013. Contest is open for those who are in the Philippines. First off, Like Kikay Corner on Facebook and follow me on Twitter and Instagram. Then, click on this link to the —–> Real Techniques Brush Giveaway Rafflecopter. Done all the steps! I hope I win! 🙂 Thanks for the giveaway.